Enjoy Autumn Break - Save Up to 20% OFF Apex Hotels, UK. Book now and enjoy your autumn vacations anywhere at London, Edinburgh, Glasgow or Dundee in Apex Hotels and save 20% on your two night stays. Get a complimentary continental breakfast & upgrade on check in. Valid for these Hotels: Apex Waterloo Place Hotel. Apex Grassmarket Hotel. Apex City of Edinburgh Hotel. Apex Haymarket Hotel. Apex City Quay Hotel & Spa. Terms & Conditions: Offer valid until 31 October 2016. �10 direct booking voucher is included and can be used for food & drink at the hotel, excluding breakfast. Minimum two night length of stay. Winter Break Offer - Save 20% OFF Apex Hotels!! Winter Break Offer - Save 20% OFF + Complimentary Services Apex Hotels. Embrace the great indoors and book a winter break at Apex Hotels. Book now and save 20% plus get a complimentary continental breakfast and room upgrade. Terms & Conditions: �10 direct booking voucher is included and can be used for food & drink at the hotel, excluding breakfast. Minimum stay for 2 nights. Offer is available from 1 December 2016 to 28 February 2017. Booking made until 31 January 2017. New Year Special Offer, Complimentary Services Apex Hotels!! New Year Special Offer, Complimentary Services Apex Hotels. Take in the bright lights, city buzz and impressive fireworks during your New Year break this year. Get complimentary breakfast every morning and a complimentary champagyne breakfast on New Year�s Day. Terms & Conditions: �10 direct booking voucher is included and can be used for food & drink at the hotel, excluding breakfast and Hogmanay dining / ball events. Booking and Stay period is until 31 December 2016. Early Booking Summer 2017: Get Up to 20% Off Apex Hotels! Early Booking Summer 2017: Get Up to 20% Off Apex Hotels. Book a Summer getaway in Apex Hotels London, Edinburgh, Glasgow or Dundee and receive complimentary upgrade on check in and breakfast. Up to 20% off on stays of two nights or more. Offer includes: Complimentary breakfast. Complimentary upgrade on check in. Children under 12 stay and eat for free. �10 voucher to spend in the hotel during your stay. Terms & Conditions: Offer valid until 31/08/2017. Offer is available on selected dates at Apex Hotels in June, July and August 2017. Bookings must be made at least 28 days in advance for stays of 2 nights or more. Winter Breaks - Save 20% OFF Apex Hotels!! Winter Breaks - Save 20% OFF Apex Hotels!! Book your stay for minimum 2 nights at Apex Hotels and save 20% plus complimentary breakfast and room upgrade. Offer Includes: Children under 12 stay and eat for free. �10 direct booking voucher is included and can be used for food & drink at the hotel, excluding breakfast. Terms & Conditions: Minimum 2 nights stay required. Offer valid until 28/02/2017. Offer is available on selected dates at Apex Hotels in December 2016, January & February 2017. Bookings must be made at least 28 days in advance. Christmas Breaks - Get 20% Discount Apex Hotels!! Christmas Breaks - Get 20% Discount Apex Hotels. Stay over the holiday period for a more relaxing break and join us for a festive dining experience or a more indulgent dinner on Christmas Day at Apex Hotels and save 20% on 2 night stays during winters. Offer includes: Complimentary breakfast and room upgrade. Children under 12 stay and eat for free. Terms & Conditions: Offer valid until 31/12/2016. Offer is available on selected dates at Apex Hotels in December 2016. Bookings must be made at least 28 days in advance. Super Saver Offer - Get Additional 10% Off!! Super Saver Offer at Apex Hotels London, Edinburgh, Glasgow, Dundee Get Additional 10% Off. Its time to enjoy Apex Hotels super saver offer. Book your stay at Apex Hotels London, Edinburgh, Glasgow or Dundee and get additional 10% off on room rates. Terms & Conditions: Offer valid until 31 October 2016. Use promo code: DIRECT. Save up to 20% Off on Family Summer Getaways!! Save up to 20% on Family Summer Getaways Apex Hotels London, Edinburgh, Glasgow or Dundee. Stay in a spacious Family Room in London, Edinburgh or Dundee this summer and make the most of family time with big attractions on your doorstep. From the moment you arrive you�ll be greeted by friendly staff and gain access to child-friendly facilities throughout the hotel including complimentary Wi-Fi to keep them entertained, kids menus in our restaurants and kids packs on arrival. Book a UK summer getaway in Apex Hotels London, Edinburgh, Glasgow or Dundee and get up to 20% off plus complimentary breakfast. Offer Include: A �10 voucher to spend during your stay. Kids stay and eat free. Terms & Conditions: Offer valid until 31 August 2016. Get Up To 20% Off!! Get up to 20% Off, Complimentary Upgrade & Breakfast Apex Hotels London, Edinburgh, Glasgow or Dundee. Book a UK summer getaway in Apex Hotels London, Edinburgh, Glasgow or Dundee and get up to 20% off plus we�ll treat you to a complimentary upgrade on check in and breakfast when you book directly. Terms & Conditions: Minimum two night stay. Booking must be made 28 days in advance. Children under 12 stay and eat for free. Booking period is until 13 June 2016 for London Hotel and 27 June 2016 for Scotland Hotel. Stay period is June August. Spring Sale Offer - Save up to 25% Off! Spring Sale Offer - Save up to 25% Off Apex Hotels, Scotland & London. Book your vacations for minimum 2 night at Apex Hotel and save up to 25% plus complimentary services. The offer is available for Apex London, Edinburgh, Glasgow, and Dundee. Terms & Conditions: Offer valid until 23 May 2016. Offer is available for stays from 1 31 July 2016 at Scotland Hotel stays. Offer is available for stays on 26 30 May and 24 July 1 September 2016 at London Hotel stays. Offer valid for minimum 2 night length of stay. Advance Booking Discount - Save 10% Off! 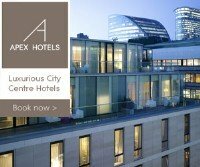 Advance Booking Discount - Save 10% Off Apex Hotels, London, Edinburgh, Glasgow, Dundee. Book your stay 3 days or more in advance and save 10% at Apex Hotels, London, Edinburgh, Glasgow, Dundee. Terms & Conditions: Offer valid until 31 December 2016. Sunday Wedding Offer at Apex Waterloo Hotels, Edinburgh! Sunday Wedding Offer at Apex Waterloo Hotels, Edinburgh. Sunday Weddings. End your week by beginning your happily ever after at Apex Waterloo Place. Offers includes: Complimentary glass of sparkling wine per guest. Bride and groom go free. Upgrade to duplex suite for the bride and groom subject to availability. �200 discount on ceremony room hire. Book Now. Save 20% Off with Best Flexible Rate!! Save 20% Off with Best Flexible Rate on Your Stay at Apex with Free Cancellation up to 14 Days Before You Stay. Use promo code: PMORE. Save 25% Off on Your Stay When You Pay In Advance For Stays! Save 25% Off on Your Stay When You Pay In Advance For Stays In Apex London, Edinburgh, Glasgow & Dundee. Use promo code: PPROMO. Book Now. Save Additional 10% Off Apex Hotels London Edinburgh Glasgow and Dundee! Save Additional 10% Off Apex Hotels London Edinburgh Glasgow and Dundee. Book your holidays at Apex Hotels London Edinburgh Glasgow and Dundee and Get additional 10% discount on public rates. Terms & Conditions: Offer valid until 30 April 2016. Use promo code: DIRECT. Apex Hotels is one of the UK’s leading operators of 4 star contemporary hotels with luxury properties based in London, Edinburgh and Dundee. At Apex Hotels you can be close to attractions, entertainment, shopping and business districts in London, Edinburgh and Dundee and feel at home. You'll enjoy great service, accommodation and facilities while you stay with us in these major UK cities.